Over time leftover files, invalid short cuts and other junk items start to build up on your PC taking up valuable disk space and cluttering your PC. 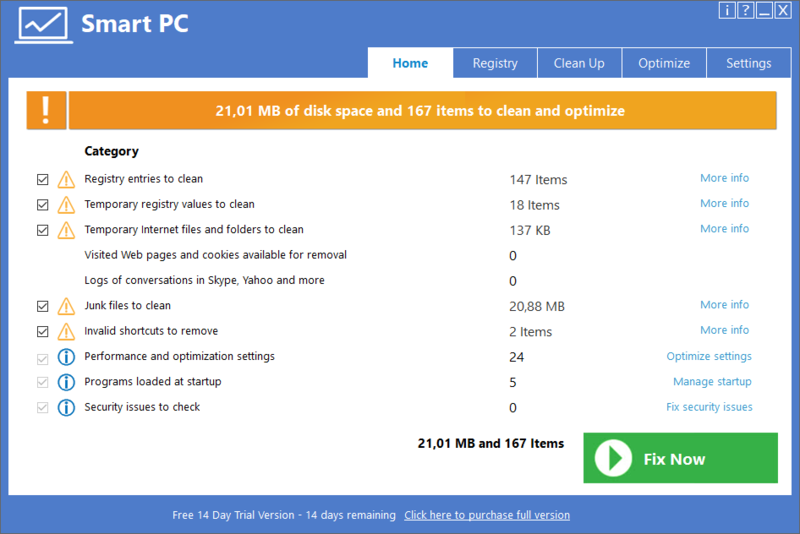 Download our FREE 14 day trial version and see for yourself how Smart PC cleans and optimizes your PC. Find and remove potential privacy risks including downloaded cookies, search histories and more. Did you know that as you surf the web information and often pictures are being collected on your computer that tell people where you have been and the sites you have visited? This information, as well as the history of recently accessed files, temporary files and items in your recycle bin can leave a trail of private information for anybody looking for it. Smart PC finds and removes privacy risks from your PC helping ensure that your private information stays secure. 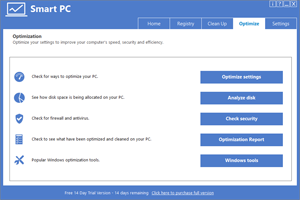 Optimize your computer settings to ensure that your PC is always working in the fastest most efficient way possible. With Smart PC you have the choice of customizing your settings or simply going with our recommendations for optimal performance speeds. Smart PC finds and removes junk files and broken short cuts which build up on your PC over time taking up valuable disk space. Smart PC identifies and removes unnecessary registry entries. Does it take forever for your computer to load windows? Removing programs from your windows startup menu will improve the start time of your PC. Smart PC’s startup manager makes it easy to identify and remove unwanted programs from your startup menu. Startup and shutdown times can be improved dramatically when just a few programs are removed from the startup menu. 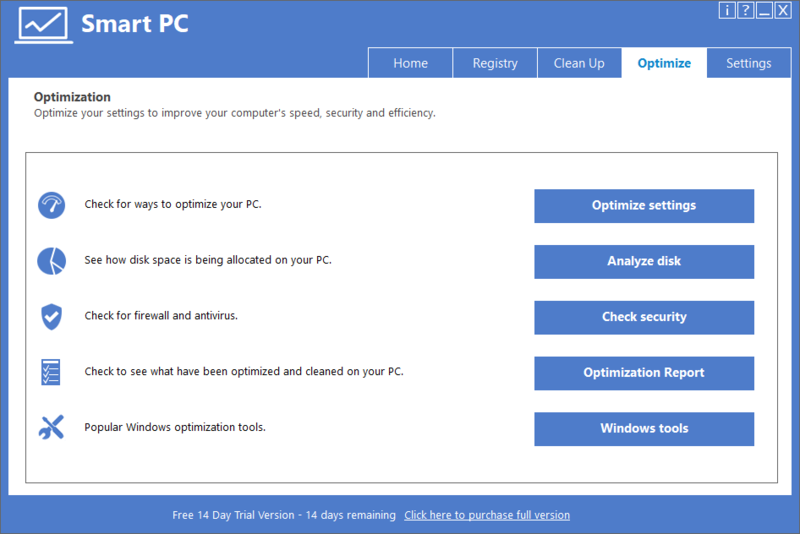 Smart PC takes the guess work out of cleaning and optimizing your PC. With Smart PC the scans are safe, fast and efficient. Finds and removes potential privacy risks including the history of recently visited websites, internet chat conversations, downloaded music, video or photos. Cookies that have been automatically downloaded will removed along with information about recently opened documents and any document searches. Finds and removes invalid short cuts and left over junk files. Optimize computer settings to ensure top performance levels. Fully customizable scans so that you can easily exclude certain files or registry keys from the clean up. Registry backup and restore gives you an extra level of security enabling you to create registry backups which you can restore should you experience any problems. Startup manager to easily remove unwanted programs from your windows startup menu.